Believe it or not, I'm not actually asking for many books for my birthday this year. My TBR is pretty huge, and I wanted clothes anyways. However, I can think of some items that would make awesome accessories to my book collection. Who doesn't love a good bookish t-shirt? 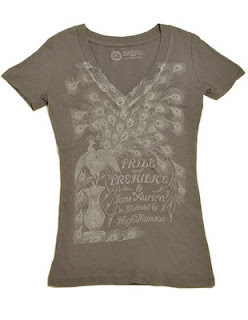 Pride and Prejudice is one of my all time favorite novels, and I think that this t-shirt, made by Out of Print, is absolutely gorgeous. It's the ninja of bookshelves--an invisible shelf! Available from Barnes and Noble, I can already think of a place in my room where this would be perfect. After all, who reading this blog has enough storage space for their books? I'm sure you're all shocked by how full of Jane Austen related items this list is! /sarcasm This is a wonderful adaptation of Sense and Sensibility, yet I don't own it. I must remedy that fact. Okay, I know what you're thinking. "Liz, what is bookish about a storage ottoman?!?!?! You've lost it." Well, I will probably be going to graduate school and I'm expecting my living quarters to be a small apartment that won't be able to contain the Beauty and the Beast library which I dream of. I could fill one of these little cubes with books from my TBR pile and take it with me! So there you have it. A couple of bookish items I'm craving. As for books I'd like, well, let's just say that list is more of an epic poem. Are there any bookish items you're hoping to get soon? Tell me about them!